God is in the deliverance business. He longs for you to be free, to know the love and presence that are better than life-and the power of His Word that defies all darkness. 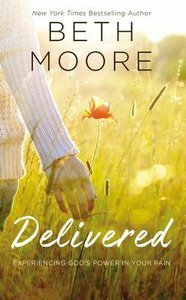 In Delivered, Beth Moore shares her own journey out of the pit and the way the poetic expressions of Psalm 40 rewarded her with a new song for her soul-given by her Savior and offered to you here in this soul-stirring book. You also can be free from the worst life has to offer and learn to take Christ's mighty arm when he reaches into the depths, and says in a way you can finally hear, Need a hand? About "Delivered: Experiencing God's Power in Your Pain"